Like AOL, compact discs, and other relics of the 20th century, faxes refuse to die. 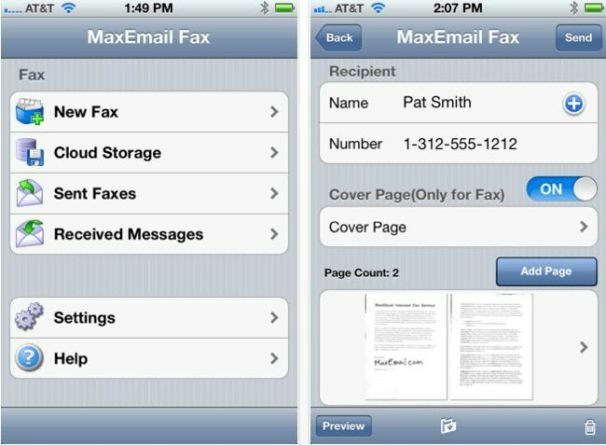 But at least we can dispense with fax machines, as evidenced by the new MaxEmail Fax app for iOS. With it you can send any photo or PDF as a fax, or, even better, snap a photo with your iPhone and send that as a fax. In other words, your iPhone (or iPad) becomes the fax machine. That may sound a little crazy, but the latest models have cameras with more than enough megapixels to photograph an entire printed page. The overall process is a little slower than just feeding pages into a machine, but you can't beat the convenience of being able to send faxes anytime, anywhere. The MaxEmail Fax app is admirably easy to use. It not only lets you snap documents with your iPhone camera, but also links to your Dropbox, Google Docs, iDesk, and/or WebDav accounts so you can fax documents from there. To use it, you'll need to sign up with MaxEmail's eponymous Web service, which offers a free 30-day trial that lets you send up to three 10-page faxes. After that, you can choose from a variety of service plans (which, incidentally, afford a lot more features than just what you get from the app). The least-expensive plan costs $24 per year (plus a $10 activation fee) and includes a personal number for receiving faxes, 100 inbound fax pages per month, and 30 days of online storage for those faxes. Outbound faxes will cost you 10 cents per page (or five cents per 30 seconds of faxing time, whichever is cheaper). There are, of course, lots of other apps that will let you send and receive faxes from your phone, though not all of them match MaxEmail Fax's support for Dropbox and other document stores. If you're looking for an easy and affordable way to put a fax machine in your pocket, this app is definitely worth a look. And while we're on the subject, be sure to check out PC World's recent feature on sending faxes from the Web. Good stuff.